Sure, The Lincoln Lawyer was a popular movie. But, here we’re all about books. Have you read any of Michael Connelly’s novels? Connelly’s Harry Bosch series is one of the best police procedural/mysteries being written. Connelly, a former newspaper reporter who covered the police beat, writes mysteries that are firmly rooted in the day-to-day reality of cops, criminals, and the lawyers who prosecute and defend those criminals. His books are laced with an authenticity that many police and crime novels lack. 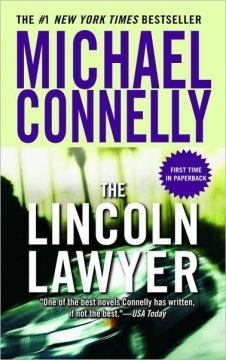 The Lincoln Lawyer, not a Harry Bosch novel, introduces Mickey Haller, the Lincoln Lawyer, a criminal defense attorney who operates out of the backseat of his Lincoln Town Car, traveling between the far-flung courthouses of Los Angeles to defend clients of every kind. Bikers, con artists, drunk drivers, drug dealers – they’re all on Mickey Haller’s client list. For him, the law is rarely about guilt or innocence, it’s about negotiation and manipulation. Sometimes it’s even about justice.